With growing pressure for meat processors to prove their chemical lean values, it is more important than ever to be able to accurately prove the fat content in your meat. Can you prove your CL (chemical lean) values correctly? With new industry trends, we’re making sure you’re not being left behind with this free guide, “Can You Guarantee Your Chemical Lean Valves?” The newest meat inspector gadget, DEXA, has brought many changes to the meat processing standard. This ebook is here to teach you why it’s crucial for your CL values to be as precise as possible and how to do so with the latest innovations to the industry. 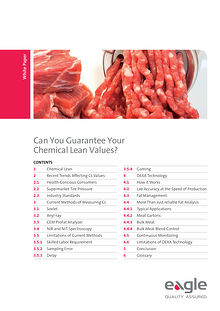 Download this free guide to discover how to determine the chemical lean value in your meat most efficiently.